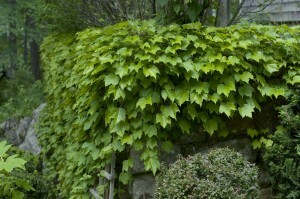 Boston ivy growing on a wall in my garden in the Northeast. You like to see vines in the garden. They add that vertical dimension that contrasts so well with your flowerbeds and containers. You probably have your favotite vine. Maybe it’s Boston ivy. Allison Kyle Leopold writes in her book The Victorian Garden that Boston ivy adds a touch of the picturesque to a landscape. It was, of course, the picturesque that was the style of English landscape gardening, beginning in the mid 18th century and then spread to America in the 19th century. In 1869 the old Veitch Nursery Company in London introduced Parthenocissus tricuspidata or Boston ivy, which came from Japan, a country that had just opened its doors to the West. It was a time when botanical gardens and botanical societies supported plant collectors, some sent also by the Veitch Nursery, who traveled to Asia as well as the United States to provide new plants. Eventually Boston ivy became part of the American plant palette. The Boston ivy offers both leafy growth that can cover a wall during the growing season and later an amazing array of autumn color. This ivy clings to stone and brick by means of adhesive tendrils quite easily. On a wall the leaves overlap to make a dense cover. Though it takes a year or more to root in, once established, it can grow 50 feet or more. The glossy dark green leaves of the Boston ivy turn bright yellow, gold, orange, and red in the fall. The Boston ivy is planted mainly for its foliage, which is shiny and 3 lobed. There are small greenish flowers, followed by bluish black or black berries. The Boston ivy only requires trimming for maintenance. It does well in full sun or partial shade and grows in well-drained, loamy, or even poor soils. Other common names for the Boston ivy are Cottage Ivy, Japanese Ivy, Japanese Creeper and Boston Creeper. Today you can see it clinging to the walls of academic buildings at Harvard University and Boston University, where it seems to add a certain sophistication to the buildings. Boston ivy was first called Ampelopsis veitchii, and it appeared as such in the Peter Henderson 1896 catalog as well as the John Lewis Childs catalog of the same year. American gardeners have loved this vine for over 150 years. Boston ivy must be doing something right.